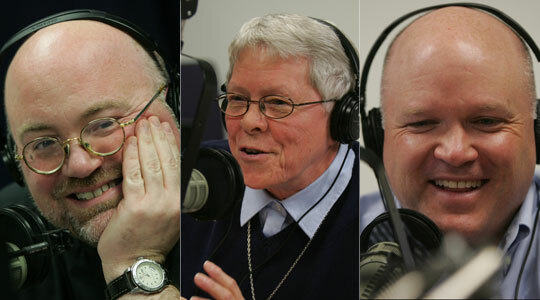 Summary of today’s show: Ursuline Sr. Bridget Haase sits down with Scot and Fr. Chip and, in her charming New Orleans accent, shows them why she’s known as a master storyteller, as she weaves stories of her 50 years in religious life, from Appalachia to the Sudan to Boston, where she now serves The Boston Home and is co-host of a weekly radio show with her brother, Fr. Albert. 1st segment: Scot welcomed Fr. Chip back to the show and noted that Fr. Chip has a new assignment as pastor of two parishes. He is still pastor of St. Mary in Wrentham and is now pastor of St. Martha in Plainville as well. He is grateful to the Cardinal for his confidence in him. Scot noted that Martha and Mary in Scripture had two personalities (the sisters, of course), and asked if they had two personalities as parishes. Fr. Chip admitted that St. Mary is named after Our Lady and the people probably wouldn’t like to re-dedicate the parish. 2nd segment: Scot welcomed Sr. Bridget to the show. She is celebrating 52 years of religious life as an Ursuline nun and in January she will celebrate 50 years after her final profession. Sister was born and raised in New Orleans, but she says people always think she has a Boston accent. She said when you love New Orleans, she’ll love you right back. Plus everybody is family. If you see a neighbor in the store, you’ll call them Aunt or Uncle and you’ll go up and give them a kiss. When she was 4 years old, she went to Ursuline Academy in junior kindergarten and she met her first nun. At first she was scared by the nun’s habit, but then she was so kind to her that she stayed at the academy throughout schooling and then entered the order after graduation. She first experienced the calling to the religious life during a mandatory retreat in her senior year. She remembers coming into a conference room where there was a huge crucifix and hearing a talk by a priest. He called the girls to attention and asked them what they’ve done for Jesus, what are they doing for him, and what will they do for him. The first two answers were “nothing” and on the third, her heart opened and heard a question in her heart asking her to be a nun. She agreed and she became an Ursuline. There was never any doubt in her after that point. She received a college degree at the College of New Rochelle and began teaching. She was assigned to first grade in Kirkwood, Missouri. There were 40 children and not even room for a desk. That was in 1965. It was an experience in which she saw the children as a gift from God. It was very hard, but it all worked out. Fr. Chip asked her if she misses it and she said she misses it terribly. Before she dies, she has a plan to go into first grade classes and be Sister Storyteller and tell stories of Catholic values. Scot asked Sr. Bridget was led her to serve in Appalachia in eastern Kentucky. She’s discovered that God comes in surprises and disguises and He always has something up the Divine Sleeve. She was watching a program with Charles Kuralt on Christmas in Appalachia. She had the same experience like with the Cross: “Would you go there?” So she went to her superiors. She did the research on where she would go and then for two summers she went to Bible camps. After that she asked to go full-time. Many people had never even seen a Catholic before, but they were welcoming. Sr. Bridget and another sister ended up living in a small shed heated by a coal stove with an outhouse. No electricity, no indoor plumbing. But everybody lived that way. They lived next door to a gentleman, Bird Bradley, who became a spiritual mentor. One day she came home from school and found he had lined the outhouse with squirrel skin fur from squirrels he’d trapped. He said it was to keep them warm in the outhouse on cold days. Another time, he was sitting under a tree and Sister asked him if he ever got lonely. He looked shocked and said, “When a man has a stout chair, a good chew of tobacco, and knows that he has God on his side, how can a man be lonely?” When we are in touch and focused on God, how can we be lonely. Years later, as she was preparing to go to another mission, she asked him what she would do if he died while she was gone. He said, “Don’t go crying. I’ll be setting purty up on top of the hill. But look here” and touched his arm “this is where I live now, but when I die I will be in a new house and there will always be room for you there.” Sr. Bridget in her five years in Appalachia came to know that we are all of us children of God. After Appalachia, Sister served in Sudan and Senegal and Mexico. Sister said she’s learned that God cares for us, but we absolutely have to care for one another. Sometimes we are God’s answer to someone else’s prayer. We have to do the little things with great loves. Nothing is inconsequential, everything matters. Everybody she meets reflects God, whether in Boston or Senegal or Sudan or Appalachia. You don’t have to go somewhere else to find God, He is all around us in everyone we meet. Fr. Chip asked her how she came to Boston. Sister said she had a dream in which she had a bus ticket and didn’t know where it was going to. She later realized that she wanted to be near her mother in her last years. Her mother was living in New Hampshire with her sister and so she asked her superior to live with the Ursuline community in Boston. They had a wonderful 4 years together until her mother began the long journey of Alzheimers. Scot noted the Ursuline sisters were among the first religious orders in Boston. The first convent was in Charlestown, and was burned down in anti-Catholic riots. They later opened a convent near Boston Common and then in Dedham. 3rd segment: Scot said Sr. Bridget has a weekly radio show with her brother, Albert, who is a Franciscan priest. It’s called “Spirit and Life” and it’s on the Relevant Radio network. Relevant Radio approached them as the first brother/sister priest/nun radio show. They’ve had about 96 shows so far. They take spiritual issues from our Catholic faith and ask what it means for the 21st century. They start each show with 5 minutes of chat they call “Bayou Banter”. They then talk 26 minutes with no commercials. It airs on Saturday and repeats throughout the weekend. The full schedule is on the Relevant Radio website and you can listen online. Scot said he first heard about Sister Bridget when he saw her book “Generous Faith: Stories to Inspire Abundant Living”, from which all the royalties go to the care of the elderly sisters of her order. She decided before she had 50 years of vows that she wanted to thank God for everything people have given her life because they way they lived inspired her. So she decided to tell their stories. She tells the stories of her mother’s Alzheimer’s and her father’s suicide. She told one of the stories from the book. She was feeling down and out one time and decided to make a retreat at the Genesis Retreat Center in Westfield, Mass. She had planned everything she wanted God to do for her on the retreat. She took the train and then buses to Springfield. She’s sitting on the bus and encountered a homeless man. She tried to look inconspicuous because she didn’t want an encounter with him. He got up and offered her a peppermint from his pocket. She refused nicely, but felt bad about it. As she was getting off the bus, she heard him yell at her, “Miss, you’re looking good, real good.” She got off the bus with a dance in her step and a song in her heart. That homeless man cared for her. It’s a witness that God never abandons us. The power of being noticed and receiving a word of encouragement. If we live in the moment, in divine care, and in the eyes of other people (the book’s three divisions), we have abundant living, knowing we are blessed by God. Jesus came that we might have life and have it in the full. Not material abundance necessarily. Fr. Chip asked who inspires her now. Sister Bridget said the Boston Home where she is spirituality coordinator. There are 96 residents, adults paralyzed with degenerative neurological disease, ages 20s, 30s, 40s, and 50s. Some have only very little mobility, in motorized chairs, moving only by sipping and blowing into a straw or with a single-finger of mobility. She’s learned to live in the moment and in the day. All we have is this day and this moment and our attitude is everything. She doesn’t find it depressing there because she’s always learning about courage and the power of the human spirit. Sister said she remembers Karen, who has since died, who came to her every day for six years and always said the same thing. She was totally paralyzed, but she would always say with great difficulty, “God is so good.” She almost died with those words on her lips. Scot said so many of us can talk an encyclopedia about God, but this one simple sentence sums up everything: “God is so good.” Sister said we have it all in our heads, but it has gotten to our heart. But Karen’s disease took all that from her head and all she had was in her heart. One of the residents came to her and he had a terrible cold. He asked her to wipe his nose. When she finished, he said he was sorry to have to ask. She asked, “Would you have done it for me?” and he said, “In a heartbeat.” That’s the washing of the feet. 4th segment: Now as we do each week at this time, we will hear the Gospel reading for this coming Sunday’s Mass and then consider its meaning for us. for you do not regard a person’s status. “Why are you testing me, you hypocrites? Scot said this is one of the more memorable images of Jesus, evading the verbal traps set by the Pharisees. If Jesus had answered yes or no, he would have offended some group, but he transcended the situation. Sister said people sometimes mix up the message, that if only we follow God we will be promised material abundance. Scot said Jesus was very blunt and direct, calling the Pharisees hypocrites and calling out their real motives. Fr. Chip said the genius of Jesus is being able to turn a yes or no question back on them. We could preach this one Gospel passage our whole lives. Scot said we have responsibilities to be a good neighbor and citizen, but we also have to be a good member of the Church. We need to do both, although our duty to God comes first. We need to understand what we need to return to God. If we’re a success, we need to remember that everything is a gift, a grace, and a blessing. Sister said we don’t do good, but that God does good through us. To God be the glory. give to God what belongs to God and that is everything you do and desire. Give your heart to God first. Scot said it’s not a fundraising pitch; it’s not about money. Give your heart, mind, soul and life back to God. Sister said sometimes we have to ask ourselves, to reflect on what belongs to God in our own lives. Scot noted that sometimes the word is render and now it is re-pay. Fr. Chip said we can’t really re-pay to Jesus what we owe him, so we try. How do we re-pay to God? Go to Mass. Jesus told us to celebrate the Mass in community. Then celebrate it with your all. Bring all your cares and worries and offer them to him, then give him praise and worship. Fr. Chip said we should give of ourselves to the parish, the people you’re in community with. We start with Mass and then are sent forward into the world to bring it to other people.